Aaron says I need to charge for this one. And I know. It’s true, I should. I’m giving away better content and education here than what other people are charging for. But I’m demonstrating what I teach you in this episode. Give away your best 10% for free. The reason this episode is so good is because I’m giving you my best. Learn to build a writing habit, the difference between content marketing and copywriting (and why not knowing the difference is destroying your sales), and what to give away for free vs. what to sell. Writing single-handedly tripled my business. Your life will change if you write 1,000 words a day. Don’t edit while you write, because it kills your efficiency, speed, and momentum. Do something every day and you’re going to improve. Set aside a day to come up with writing topics for the next week or two. Start with a commitment to develop a writing habit. If you don’t have something to sell, you’re not doing content marketing, you’re just making content. Teach what you know to show people your expertise. Give away your best 10%. You have to give people what they need in a package of what they want. Don’t over-simplify something that is necessarily complex. Every piece of content should be selling. Do things that move the needle in your business—don’t get stuck in a rut with writing. Learn to write copy that sells, master the art of advancing people on the buyer's journey, and move people to buying with your words. 02:05 Sean: This episode is going to be like an honorary It All Starts With Writing episode (Related: e39 It All Starts With Writing and e139 It All Starts With Writing (Again)). Sometimes, I like to do anniversary type episodes every hundred, and we didn’t do that this time with writing. This one is kind of along the same vein—the importance of writing, the power of writing. Before we get into that, I want to let people know that on March 29th, 2016, I’m launching my Supercharge Your Writing course. 02:51 It’s an in-depth master class level course on learning to grow your business with writing. Find your unique writing voice, develop a writing habit, eliminate writer’s block forever, and plan ahead with an editorial calendar… I did a workshop as a mini version of this full course that I’m doing, and a few hundred people signed up for that workshop. They said that the editorial calendar part was one of the biggest takeaways for them. 03:26 Ben: As a person who’s trying to publish regular content, the editorial calendar is vital. 03:33 Sean: This method allowed them, within five or ten minutes, to get months planned out on their schedule. How huge is that? So many people are writing the night before, scrambling the night before, and this totally eliminates that problem. Learn to sell with words, learn to grow your business with writing. We also have a live webinar coming up there, so if you go to SuperchargeYourWriting.com, check it out, and sign up, we’re going to have a live event with free training. If it’s in the future and past the date because you’re listening back to the podcast episodes, still go to the website, because there will still be free training there. We’re going to record that stuff for you. 04:24 One of the big themes of the show is that it all starts with writing. Writing really did supercharge my business—that was when everything changed. Why writing? It all started with writing. You’ll notice the featured image on this episode is a little graph. The points on the graph start to increase, to go up. This graph in the image is my real annual revenue. Those dots represent what I made. To some of the people who are subscribed at Supercharge Your Writing, I go more in depth on that. You don’t see dollar amounts on this image, but it’s pretty substantial. 05:58 We’re talking about well under $100,000, more like $30,000 a year. Then I made $40,000, then I made $50,000, then I made $59,000. It was very incremental. After a year of hard work, because nothing happens overnight, suddenly we are into the six figures and multiple six figures. It has been increasing ever since, and I owe that all to writing. Writing supercharged my business—it was the missing piece. 06:35 Previously, I worked with clients. I’ve worked in three businesses with client services, but I wasn’t really ever writing. Every once in a while, I would do a case study of a client project, but I wasn’t purposefully applying myself to writing. Once I did, that is the single most important thing that has changed everything in my business. 07:06 Ben: I see dips and valleys in my business growth and my ability to provide value and make an income in times when I haven’t been as purposeful about writing consistently. Some of the ideas I have are great. Some of the things I have to share, that I want to put out there, are fantastic, but writing is this necessary bridge that you need to cross to share that with the world and turn those ideas into value that you can cash in on. Through writing, other people can listen to those ideas and better their situation. You have to cross that bridge. 07:50 Sean: When I started writing every single day, regularly, it wasn’t the next day after the first piece that I wrote, but within the next year my business tripled. Writing single-handedly tripled my business. In the beginning, I was writing for the sake of writing. I didn’t know what I should be writing about or how I should use it. I knew it was powerful, but I didn’t know how to wield it. It was when I learned the difference between content marketing and copywriting that it started to become a purposeful thing. 08:28 I also learned that those two things are not mutually exclusive, and they should work in tandem. I go into that more in the Supercharge Your Writing course, how to use those together intentionally. That’s what I want to talk about today. One of the questions is, “How much should you give away for free and how much should you sell?” Today, I’m going to give away a lot of stuff for free. I’m also going to be explaining how much I think you should be giving away for free vs. selling. Right now, I’m still learning this stuff. I learned that copywriting and content marketing need to be used together, but I’m continuing to evolve my understanding of how they should be used together and how to use them. 09:17 I just hired a consultant who is nearly $1,000 an hour, but I thought, “If I hire this guy and he gets me a sale or two on any of my products, then I’m good.” He’s a very knowledgable marketer and writer, and it’s virtually impossible for me to imagine hiring him and talking to him for an hour and getting nothing in return. Sure enough, he blew everything out of the water for me. I had all of these things I was doing that were working great, and he showed me how they could do even better. It’s an idea that he’s developing that’s still in beta, but just by hiring him to be my consultant, he wants to give me this. He wants to provide value to me, because he’s excited about what he’s doing. 10:17 He’s excited about what I’m doing. So, he said, “I’m working on this other thing, I’d love to see what you think of it,” and that could be worth thousands. Any time I’ve met influential people or learned things, gone on retreats that cost me $2,000, gone to conferences where I’ve met influential people, it’s because I invested. I’ve built a relationship with those people. They share my stuff and I share their stuff, they speak at seanwes conference—that comes from relationships I’ve built and invested in. 11:01 This relationship that’s forming is similar. I’m getting a ton out of it, and it’s not only helping me with the thing I hired him to consult on, but all of the other products that I’m working on. I can also teach this information. It’s just so valuable. He’s still developing this idea, so I’m extrapolating from it and seeing where he’s going. The way I refer to it is “front-loading the value.” A lot of marketers try to get as many opt-ins as they can. They want to get everyone on their email list, as many emails as possible, so they have these Squeeze Pages. It’s like a landing page where they say, “Sign up! Sign up!” They just want you to put your email in the box. 11:53 But why do you want people to do that? So you can send them emails. Why do you want to send them emails? So you can provide value and establish your expertise. Why do you want to do that? So they trust you. Why do you want them to trust you? So I can sell my products. Okay, now we understand the reason and the why behind all of this. Why not take the thing that you were going to give people when they signed up for your newsletter and just give it to them? I lost sight of the original thing that went well for me, which was the Learn Lettering guide that I put up on my site before I knew anything about email marketing. 12:29 I just put it up on the site. Value was right there, and what did people do? They shared it. That’s what people do. They share valuable information. Rather than having a landing page asking for people’s email, what if you front-loaded the value? You taught, provided value, and said, “If you’d like to learn more, click here.” You go to a second page, and you prove more and more value. You want to learn what that thing is? Let me show you in a video. Click here. You go to another page, more value. There’s the video right there. You haven’t given up an email address or anything at this point. 13:03 There’s a certain way that I will explain at some point, probably in the course, that you eventually convert that person. By the time you do, they are the best kind of qualified lead. The only downside to this is that you don’t have the vanity metric of saying, “I have 40,000 subscribers.” Who cares? Why don’t you want the right people, for whom you pay less, because you don’t have as many people on your list and you have a lower email service provider bill? 13:37 Ben: People are thinking about this in terms of how, across the board, there is an industry standard percentage of people on your email list that will convert. Basically, they’re saying that they’re a slave to that percentage. That’s not necessarily true if you build your list the right way. If you build your list based on people who are already excited about the value you have to offer, that percentage is going to go up. It’s not going to stay at what the average is. The reason email convert averages exist is because people are trying to get subscribers as quickly as possible. You can get a much higher email conversion rate when you have the right people on your list in the first place. 14:16 Sean: Wouldn’t you love a 50% conversion rate on 100 people rather than a 5% conversion rate on 500 people? It’s just better. Plus, there are so many benefits to this. When you’re front-loading the value, you’re creating pages that are worthy of being shared. Why would someone not share this page that’s pure value? 15:13 Sean: You’re empowering the people who share your content because you’re making them look good. That’s a great point. 15:28 How many people listening right now have heard me repeatedly talk about writing and have seen the growth of my business—we made nearly half a million dollars last year—they’ve seen the results, and they haven’t started writing? They haven’t seen results. Why do I continue to talk about this subject? Why do I continue to see results, and why do people continue to listen and not act? 16:04 Ben: The Magic of 7. Do you have a theory as to why people don’t get started? Maybe they’ve already heard it seven times and they completely agree with the idea. Why aren’t they writing? 16:22 Sean: My challenge to people is to write 1,000 words a day. Your life will change if you write 1,000 words a day (Related: e142 Taking Action). If you look back on your life a year from now, you will attribute where you are to the choice you made today to write 1,000 words a day. I guarantee it. People have told me, “I didn’t write 1,000 words. I didn’t have time, I had to go to work, so I figured, since I couldn’t write 1,000 words a day, I would do it every three days. I think I can get enough of a time block where I could probably get 1,000 words done every three days.” That turns into a week, which turns into never. 17:19 They miss the whole point. The point isn’t to write more than 999 words a day. The point is to write every single day, and the 1,000 words is just a goal. The point is to develop the writing habit. You have to write every single day. Don’t start when you’re good at writing. Don’t start when you’re perfect. Don’t start when you know what to write about. In the pre-show, we were talkind about flow state. In Supercharge Your Writing, I talk about how to overcome writer’s block. Imagine removing the backspace key on your keyboard so you can’t backspace. You can only go forward and write, don’t edit. 18:08 They say, “I didn’t want to say it quite like that.” It doesn’t matter. Keep going. Editing is a second phase where you come back—don’t do it while you’re writing. People sent in images of how they actually ripped out the backspace key on their keyboard. That was just a metaphor, but they actually ripped it out. One of the Community members, Steve, wrote this web app, so if you go to nope.press, you can just start typing. When you hit the backspace key, you hear this soundbite, “Nope.” It won’t let you delete or backspace. 18:44 Ben: You can’t even select it and delete it. It’s pretty nice. 18:52 Sean: He found this other app that does something similar, but it’s even scarier. This app is called Flowstate. Say you want to write for 20 minutes. It might be customizable, but every ten seconds, if you haven’t written in those ten seconds and you are within your 20 minute allotment, it will erase everything you’ve written. You have to keep going. As it gets closer, up to ten seconds, the words start to fade. They start to disappear from the page, so you realize that they’re about to be gone forever if you do not continue writing. It’s super scary. I can’t bring myself to download it. I know, for a fact, that if I did it, I would keep writing. 19:51 You have to go until the end of the writing time, or you’ll lose everything you’ve written. I promise you, you will keep going. That proves that there’s no such thing as writer’s block. It’s all in your head. 20:04 Ben: I think the average words per minute is something like 50, that people can type. 50 words per minute is 20 minutes to get to 1,000 words—if you just keep typing. That’s the average, so most people are probably faster than that. I have 20 minutes. I’ve probably got 30 minutes or an hour that I can devote to writing. I love the idea of doing it daily, because when you do something daily, you’re forcing yourself to practice, even if you’re not doing the deliberate practice of trying to get your typing voice to match the way you normally iterate out loud. 21:25 Sean: There were two study groups, and both were told that they needed to make clay pots. One study group was told that they were going to be judged on the quality of their pots. They needed to come up with the best pot, and the closest it was to perfect, the better their score. The second study group was told that they were going to be judged on the quantity of pots. The more pots they were able to create, the better their score. What’s interesting is that the best pots came from the second study group, who was being judged on quantity. 22:06 They didn’t come from the first group that was being judged on quality. It’s because they kept iterating, improving, and getting better. They were shipping. They were just creating. They were making more, making more, making more, and becoming more efficient. They were getting better by doing. If you do something every day, you’re going to improve. 22:26 Ben: You’re going to experience a little bit less resistance every time you sit down. You’re going to feel a little bit more natural every time you start typing. The editor, that voice that tells you, “That sound dumb,” or, “You need to delete that,” is going to get quieter and quieter. It has to be a daily thing. Otherwise, you don’t get to experience that gradual increase in ability. 23:01 Sean: Writing is how you make a name for yourself. Writing is how you establish yourself as an expert. Kyle in the chat just said, “If you don’t write, you don’t have a voice outside of yourself. If you don’t have a voice outside of yourself, you can’t help others or possibly be seen as an expert.” To develop a writing habit, you have to start with commitment. The commitment is to write every day. You probably want to set a regular time so that it’s even more consistent. Don’t say, “At some point I will write today,” but, “I’m going to write every single day at this time.” I recommend 1,000 words as a goal, but don’t let that discourage you. 23:47 If you’re not able to reach that in the allotted time and you have to go to work, don’t worry about that. Don’t take that as a sign to quit. Keep going. You’re going to get better. Maybe wake up 15 minutes earlier. Maybe write a little faster and don’t edit as you go. Get a little more efficient. The point is to develop the writing habit. The hardest part about writing is showing up. It’s getting out of bed a little bit earlier, showing up, and getting in front of the blank page. 24:20 The second hardest thing is to start writing. We don’t know what to write about, and we often feel like the first words that come out are the first words anyone will see, and they need to be perfect. That’s not the case. You can edit later, so just get it all out. I like to do stream of consciousness writing, where every thought you think, you have to put on the paper. Even if you’re thinking about writing, how hard writing is, or how you have nothing to say and you’re tired, all of those words and thoughts are on the paper. You can edit and remove them later, but you want to decrease the friction. The other thing that decreases the friction is knowing what you’re writing about today. 25:07 It’s one thing to not know exactly how to say what you want to say, and it’s another to not know what you want to say about it the first place. The place to come up with what you’re writing about that day is not when you sit down in front of the computer or your notebook. It’s beforehand, the day before or the week before. Set aside a day to come up with writing topics for the following week. 25:32 Assign those topics. Schedule those topics for specific days. When you get to that day, there’s no question about what you’re writing about. You have it right in front of you, and you can begin immediately. 25:45 Ben: I like thinking about your past self and your future self, and thinking of those as two different people. Your past or present self can do your future self a favor by coming up with those topics, because then your future self doesn’t have to have the friction of thinking of what to talk about. There are so many other benefits to doing work while keeping your future self in mind and doing your future self a favor. I’m not great at writing without editing on my own, and part of that is that I can’t keep up with myself. I tend to think pretty quickly, and I do a lot of thinking out loud. 26:39 One of the things that I’ve started doing every once in a while when we’re on a car trip or something is that I’ll have Rachel help me dictate what I’m thinking about. I do a similar process. I’m driving, I have a topic, and I think out loud the way that I usually do. I’ve done this recently with something I’ve gone back and edited after the fact, and though it’s not very coherent and it’s definitely not something I would ship in it’s form, I’m so glad that I have it. When I’m thinking out loud and I’m not hindered by whether what I’m saying will make sense to somebody else, I get a lot more out. 27:35 I get into stuff that I may not have thought of if I was sitting there, trying to be critical about what I’m putting on the page. My goal is to have that experience when I sit down to type, but it may have to start with having somebody who can transcribe it for you or recording it and having software transcribe it for you. It’s much better if you can be the one thinking and transcribing simultaneously on the page. 28:17 Sean: Vee says, “Confession. I can’t even write the About Me on my website. It’s still empty.” Allison said, “Encouragement, friend. It took me years. That’s a harder thing to write than most things, so work up to it.” I just updated my About page a few weeks ago, and it was outdated by years. I write a million words a year, so don’t feel bad. Writing your own About page is probably one of the hardest things. 28:52 I like thinking of it in terms of the elevator pitch. Ask someone to tell you your story back to you after you’ve told them the whole thing, because they do a a little bit better job of being objective about it. Take that as an outline and expound upon that story. 29:15 Ben: If you are truly being objective, there’s the part of you that worries that what you’re saying is too self-serving and that people will read into it. You’re so attached to it. It’s not like other content when you’re writing about yourself. 29:34 Sean: Think of your About page more as a story. Don’t try and tell people who you are in a paragraph, but tell them a story. Write something long form. People are interested in that. If they’re on your About page, they’re interested. They’re there because they care about who you are and they want to learn more, so take them on a journey. Share from your firsthand experience what you’ve done, where you came from, how you got here, the pitfalls along the way, the struggles, the challenges, and how you overcame. Share all of that in a story. Don’t write a history book about yourself,write a novel. 31:20 There’s a difference between writing formal essays and writing for the internet and writing for business. Writing for your business—writing that converts, that sells, isn’t always going to follow all of the rules that proper etiquette writing does. For instance, the content you have in a paragraph should all be related. While you’re on a single thought, that information should be contained within a single paragraph, generally. With writing for the internet, understand and assume that 80% of your readers are skimming and not reading word for word, because that’s probably the case. If they see a big paragraph, they’re going to feel intimidated. 32:12 This sounds frustrating, especially if you’re really big on proper writing, but you have to break it down. Some people overdo this, especially marketers, where they will only write one sentence per paragraph and then they hit the return key twice. That’s going a little bit overboard. Try and keep it concise, but generally avoid having more than four lines in a paragraph. People will gloss over that, and every paragraph is a new entrance point. It’s a new place for their eyes to jump to and to scan. 32:48 If something is at the beginning of a paragraph, it’s more likely that they’ll see it, read it, and retain it. If it’s inside a paragraph, it might be glossed over and missed. 33:03 A lot of people don’t understand the difference between these two things, and it’s destroying their sales. Let’s talk about content marketing first. Content marketing is providing value; copywriting is selling. There are a lot of people who only do one or the other. If you neglect one of them, you’re going to have a bad time and it’s not going to work out. You need both of them. 33:35 Ben: A single piece includes content marketing and copywriting? 33:38 Sean: Yes, Ben, you guessed the conclusion. Every single one of your pieces should contain both content marketing and copywriting. This is something that a lot of people miss. Content marketing is providing value, but if you’re only providing value and you’re not selling or promoting anything, then it’s just content. It’s not content marketing. However, if you are only doing copywriting, you come across as pushy or sales-y, and you’ve seen this in real life with pushy salesmen. You’ve also seen this on webpages or landing pages that feel really aggressive, off-putting, and slimy. 34:23 These writers are trying to make copywriting do too much, more than the job that it should do. Copywriting is selling. It’s the little nudge, the final push for someone who already knows you, trusts you, likes you, believes in your services, and thinks that they are probably the right solution for them. Copywriting is just closing the deal. If you try and make copywriting do everything from beginning to end, that’s where it makes people feel like you’re being too aggressive. If you go overboard on content marketing, provide a bunch of value, and never sell anything, you’re going to run yourself out of business. 35:10 I’ve run into this problem. We’ve gotten close a time or two to running outselves out of business because we’re giving away too much. In a little bit, I’m going to talk about how much to give away for free vs. how much to sell. You have to use content marketing and copywriting together. What has this podcast episode been so far, Cory? Has this episode been content marketing or has it been copywriting? 35:46 Cory: Content marketing, because it’s providing value and not selling. 35:52 Sean: Ben, do you agree? 35:54 Ben: I agree in part. 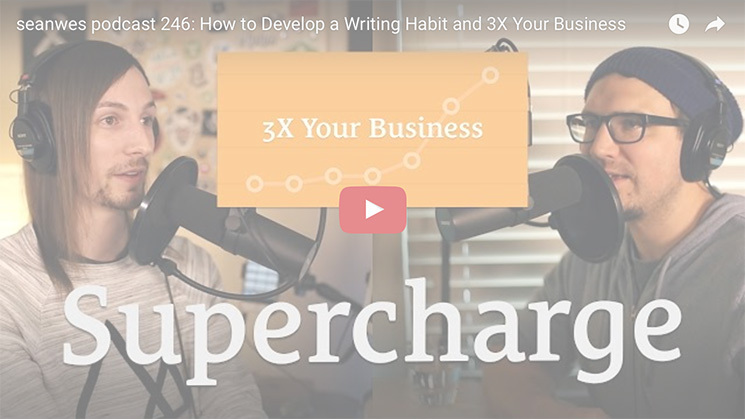 In the very beginning of the episode, Sean talked about Supercharge Your Writing. 36:02 Sean: Bingo. There was a little bit of selling, because I’m promoting something. I told everyone to go to SuperchargeYourWriting.com. I’m going to give more free training, but there’s also a full course coming along. Even if I’m not saying, “Go buy this right now,” I’m selling the idea of going to SuperchargeYourWriting.com and signing up. After that, I provided a bunch of value. The reason I could say that upfront before providing value is because we’re on episode 246. It’s about understanding the context. The other reason is that I wanted to bookend this episode. 36:42 Right now, we are in the content marketing phase. I’m providing value. We’re teaching people, we’re educating people, and all of this is free. Towards the end, I’m also going to mention SuperchargeYourWriting.com again. You shouldn’t start with copywriting. Every piece of content should also be selling. Whatever the media, every piece should be content marketing and copywriting. 37:37 Ben: Even in the very beginning? 37:39 Sean: By “very beginning,” you don’t mean of the piece, but when you’re starting out? 37:43 Ben: Yes, when you’re just starting out. 37:45 Sean: Yes. I put out a bunch of value with no strings attached, no selling. In this podcast, we do a little bit of it. We’ll either say, “Join the Community,” or we’ll promote something relevant, and that’s a little bit of selling. If anything, it’s too little. We err on the side of giving away value. In other places, I’ve given away a ton with nothing, no strings attached, not asking for a sign up or a purchase. That’s good, and it’s going to build up a bunch of good will, but it’s also missing out. You’ve earned the right to promote something. 39:26 Sean: You have to have a product. You need something to sell or you will eventually run yourself into the ground. 39:37 Ben: Could what you’re selling be getting people to sign up for your email newsletter? 39:47 Sean: No, not if we’re talking about business. A lot of this can apply to charity or philanthropy. If you want to give away value to the world because you want to help the world and you’re altruistic, that’s fine. This is the context of a business. Let’s break this down. Business is commerce. Commerce is transactional, the exchange of goods or services for money or some form of compensation. If you don’t have a product or a service, you’re not in business. You’re not selling. We’re here to talk about how to grow your business with writing, not how to write because it’s fun. 41:13 It is fun, and you can write for fun, but that’s not the scope of this episode. You have to have something sell, otherwise you’re just putting out content. You’re not doing content marketing. Marketing is the promotion of something that is for sale, so what are you marketing? You need a product. 41:53 Ben: Can you change out “product” with “service”? 41:55 Sean: Yes. Products and services are interchangeable. If you want to grow you business and do content marketing, you have to market something, promote something, sell something. For all of this, the prerequisite is that you have something to sell. In the chat room, I put two messages: “I have a product to sell,” and, “I don’t have a product to sell,” and I asked people to star which one is the case for them. Right now, 21 people have a product to sell. This is good. The number of people who don’t have a product to sell is up to 5. I want to talk to both of these. 42:36 If you starred, “I have a product to sell,” put it in the chat and say what you have to sell, whether it’s a product or service. I’ll use some of your personal examples and I’ll talk about it. While those people are putting in the things that they’re selling, I want to talk to the people who don’t have anything to sell yet. I wasted a bunch of time, and that’s not to say that it’s time I won’t get back. It’s not to say that, in five years, I won’t do well because I gave away a bunch first. I probably will, but I could have made money sooner had I had something to sell. If you don’t have a product yet, your number one priority is to get something to sell. 43:27 You need to have something to sell. It starts making so much more sense. I’m totally transparent here. Do you know why we’re doing an episode today on writing, Cory? 43:39 Cory: So you can sell the course. 43:40 Sean: Exactly. It’s like we have a business. We’re talking about writing today because I want people to go to SuperchargeYourWriting.com and sign up, because I’m doing a course. We’ve been talking for 45 minutes, and I haven’t even begun to tell you what all the things are, let alone go in depth on them. I simply can’t do it in a podcast. I’ll try and help you as much as I can, but if you want the meat, get a course. You will save so much time. You can figure all this stuff out on your own if you apply yourself and work for five years figuring out all the wrong ways and correcting them. 44:21 You can do that. If you’re young and you don’t have the resources, then do that. Start now, figure it out, and solve the problems. I’ve already done that for the past five years, so if you value that information and getting on the fast track, if you value your time more than your money, it makes logical business sense for you to invest in a course. Because I have a product, which is a course in this case, I know immediately what my content should be about. We are doing content marketing right now. We’re providing value on a topic to promote a course. This is where you need to be. 45:02 Right now, you’re doing what I did several years ago, which is throwing up writing on the wall and seeing what sticks. It’s great to start practicing in the beginning, because you need to build that writing habit, but everyone wants a return on their investment. Why do we wake up at 6am? Why do we wake up at 5am and write 1,000 or 2,000 words a day? Why are we showing up and doing this? Hopefully, so we can sustain ourselves and get freedom. To sustain yourself, you need a product. 45:45 I told people in How to Become a Learning Machine that any time someone mentions something like a name or a show, go back to it. If you’re not familiar with it, pause the episode and go consume that. Go on the path, follow the rabbit trails. I should have charged money for episode 177, How to Determine What Your First Product Should Be. People were saying that this episode changed everything for them. This is where Aaron Dowd starting working on his first product. Someone in the chat last week said that this one changed everything for them. Go back to episode 177 if you haven’t made a product. 46:46 I’m going to go back to the poll results. 27 of the people who voted have a product, so let’s see what people have: logo design, design services, photography services/portraiture/head shots, podcast consulting, T-shirts, prints, notebooks, patterns, swatches, albums, and coaching—some people are musicians. There’s people who do short films, copywriting services, architectural design, and so on. 48:05 That is one way. The other way is to teach what you know. I’ve said this a lot, but I’ve had a lot of conversations with people individually, and I know that they’re still not doing this. They’re still not teaching what they know. When you teach what you know, you show people your expertise. Yes, one byproduct of that is that people come to you, see you as an expert, and want to learn from you how to do what you do. Some people get caught up on this, and they say, “But I don’t want to build an audience! I want to attract clients.” It’s doing the same thing. 48:38 You’re building an audience, but you’re also showing that you’re good. Clients come along and see 20 pages of blog posts that show that you know how to do what you’re doing. You’re talking about lighting, and they think, “Great, I don’t care about all that stuff, but at least they do. I want to hire them.” That’s what Ben should be writing about. 49:04 Ben: I get where that argument comes from, wanting to focus on clients because that’s where you’re making your money. What does an audience have to do with that? You get so many benefits from that, though. You get the byproduct of attracting potential clients because you’re demonstrating your expertise, but as a bonus, now you have an audience. If you write what you know and you want to shift from providing services to teaching, you have an audience built around your expertise. 49:43 Sean: Diversified sources of income—that’s great! I love all the stuff we’re getting here: software security assessments, crocheted stuff, painting, illustrations, video production services, motion design and animation services, paintings, drawings, teachings… If you aren’t getting it at this point, these are all the people in the Community. If you didn’t know the people in the Community, it’s a diversified bunch. If you’re worried that you won’t fit in, it’s about your mindset. You’ll fit in. Let’s talk about Pete and software security assessments. 50:27 There are a number of things he could be writing about. Because it’s security based, I would actually go the fear route. What happens if you don’t have security? Paint that picture. It’s the same with backup services. What does it look like to lose your data? This is something I teach in Value-Based Pricing in one of the free training videos people get when they go to the website and sign up. Our wedding photographer lost or photos—that’s the short version of the story. We don’t have the photos from our wedding. My wife would be willing to pay a lot of money to get those back, and there’s no way for that to happen. 51:22 The reason this happened was because we hired someone we knew for a ridiculously low amount. We thought, “Anyone can take photos. As long as it’s decent. Yeah, it’s a student, but they’re doing pretty good. They know how to hold a camera.” We didn’t think about the cost of not working with a professional. You don’t think, “What if we don’t get our photos?” We thought, “When we get our photos, how good are they? Is it good enough?” What is the cost of not working with a professional? A professional has three or four backups. 52:01 Guess what? You’re a professional photographer and you’re rolling your eyes right now and cringing about how this person is such a noob, but you’re the noob, because you’re not teaching people that you’re different. You’re not teaching them that you have backups. You’re not telling the story of the cost of working with someone who’s not a professional. We’ve had clients tell us horror stories of the last time they worked with someone who lost all of their photos. If you don’t tell the story of the cost of not hiring a professional, your client is not thinking about it. 52:30 They don’t see that as any form of value or a reason to go with you. It’s the same with security. If you’re selling security, tell the story of what happens when you don’t have security. 53:54 Sean: You have to know your target audience. When you tell your story, whether it’s content marketing or copywriting, you need to speak your customer’s language. There are a lot of ways to learn this, but the best way is to talk with people face to face. If you can’t do that, try and get on a call or video. If you can’t do that, try and get on email. If you can’t do that, go watch people on Twitter and search for key words. See what people are talking about that they’re struggling with and use their language. If you’re speaking your language, it won’t relate to them, even if you have the solution to their problem. You have to give people what they need in a package of what they want. 54:51 Ben: If they need to know some of your language in order for you to communicate with them effectively, take some time to use their language to teach them some of your own language. Maybe they do need to understand what this term means in order for them to have a fundamental understanding of security. You can use language they understand to teach them what that means. What to Give Away for Free vs. What to Sell? 55:28 Sean: Give away the best 10%. Don’t mishear me—the best 10%, not just any 10%. When people receive that value, they will assume that everything else is just as good, if not better. “Wow, if the free stuff is this good, I can’t wait to sign up for the full thing!” That’s why you give them the best. Don’t hold back. Also, realize the value of consolidation. If you have a course, you can package up things you’ve shared for free in public and put them in a paid product. Of course, things you talk about in free content will make their way into the paid content. 56:17 It’s not only that it’s inevitable, it’s that they should be there, because a lot of that stuff is setting the groundwork. You need to hear that, and if you’ve heard it before, you need to hear it again. When people join my paid courses, they see some things they’ve heard before in the free content. I’ve never had a person be upset, because it’s in a context that’s going deeper and giving them a deeper understanding. 56:45 Ben: Hearing it, even though they’ve heard it before, is worth more to them because they’ve actually paid for it. They’re treating that information differently than they do the free material. 56:57 Sean: That’s true. The other factor is that not everyone will go through all of your 246 podcast episodes. Even if they did, it took them a year or two. This is a valuable conversation, and you’ve probably learned more in this hour than you did in the hour watching Netflix or the hour driving on your commute without this podcast. I certainly hope so, but it’s still not as condensed as it could be. That’s because it’s a podcast, and as hard as we strive to provide value here, it’s still free. I give this same topic in the Supercharge Your Writing course, but it’s much more condensed. 57:38 I spend hours, days, weeks, and months condensing, writing, re-writing, sharing with people, refining, and scripting out. It’s just going through this rock-tumbler, getting polished over and over. When you come in and consume it, it’s just a fire hose of educational material. It’s exactly what you need, everything that you need, and nothing else. That’s valuable, and people downplay that when they are creating something that’s comprised of a lot of things they’ve given away for free here and there. 99% of people haven’t heard every one of those pieces. 58:18 It’s about the context in which you’re presenting it now, all together. That is a new kind of value. Even the people who have heard those individual pieces need to hear them again, and they need to hear them in this new context. All that to say, give away your best content for free, the best piece of what you have, because it will help people trust you and see the value of what you have to sell. 58:53 That’s not to say that you can’t tell anyone parts of the how, but that’s a general rule of thumb. Matt and I are working on something we call the Expansion Framework, and it’s a step by step guide to making $100,000 a month. A month, not a year. It’s very doable, but you have to understand how it breaks down. You also have to understand that, in most cases, you can’t sell 20,000 $5 products to make that every month. It’s going to look something like 667 $5 products every day, and if you go off of a 2% conversion rate, you’re going to need something like 30,000 visitors a day, a million a month. 59:38 You probably don’t have that, so it breaks it down. It shows you in a framework exactly what you need, what kinds of things you need to sell, and we call it “the range.” It’s your product range, and we explain what that needs to be. As soon as we explain it, you see all of the holes in your own business. You see, “I don’t have that, and I don’t have that.” All of these missed opportunities. Guess what? We’re giving all of that away for free. We are teaching people the what of what we call the Expansion Framework. None of this is ready yet, and it won’t be until later in the year next year. 1:00:18 Every single person we’ve showed this to privately as we’re developing it has had an “aha” moment. They go, “Oh my goodness. I didn’t even realize what I didn’t know, and now I can take that and I can go make more money.” We’re giving that away, and that’s fine, because that is the what. Hopefully, people get value out of the what and they apply it and see a difference in their life and in their business. Then, you can sell the how. Get really practical and go really deep on the most important things. Give away 10%, give away the what, sell the how. 1:01:07 Ben: In the balance between content marketing and copywriting, should that balance be in proportion to the size or value of what you’re selling? If you’re selling something relatively low in value, should your copywriting to content marketing ratio be different than when you’re selling something relatively high in value? 1:01:32 Sean: The lower the price point, the less upfront education is needed. That’s a rule of thumb, and it’s not necessarily entirely accurate or scalable. There’s some relativity to it. Meaning, depending on the product, the target audience, and the prospect, what seems like a lot is something that varies. If you have a $5 product, you might think that is inexpensive. If you have a $5,000 product, you might think that’s expensive. $5,000 is only expensive because I just said $5. It’s all about positioning. $5,000 to an enterprise client is nothing. 1:02:20 It’s all about the prospect and the actual product and the value you’re delivering. It’s relative, but generally, if something is expensive—relative to the market, the product, and the prospect—the more education is needed. You might have to do a lot more content marketing. This goes back to the long game. I’ve seen this with other marketers. They have had people open 967 emails from them and then buy a product. I don’t know how many emails you’re sending, but if you send one a day, that’s about three years. 1:03:05 You’re probably not sending one a day, so it’s going to be more like five or ten years. How long of a game are you playing here? Some people need a lot of time. I’m playing a really long game here, because I’m very interested in catering to a younger audience. I often think of the younger version of myself, and I put a face on that with my younger brothers. I think of my brothers Cory, Caleb, and Cameron. Cory is 22, Caleb is 21, and Cameron turns 18 this month. If you’re like most 18 or 20 year olds, you probably don’t have a lot of money. I certainly didn’t. 1:04:04 I’m giving a bunch of value to this younger generation who can’t pay me back. That seems like a quick way to go out of business, and it is if you’re not making money in the meantime. This goes back to the person who’s interested in writing and in content marketing, but they don’t have anything to sell. You need to have something to sell now to give purpose to all of the content you’re writing. My goal is to survive in the meantime while I invest in my five and ten year long game. 1:04:34 I expect all of these 15, 16, and 17 year olds to learn from me over the next five to ten years for free. I keep getting emails of people saying, “I learned more from listening to your podcast than everything I did to get my MBA.” That is what I love. I want to give away so much that people feel that way, so that in ten years, they buy something from me. The point of that was that the more expensive something is, the more education is needed. Not everyone is in the position to buy from you, so keep providing value through content marketing. 1:05:19 Even if it’s not “expensive,” if it’s something they can’t afford, it’s expensive to them. It’s a time factor, and it may be 967 emails before someone buys from you. 1:05:36 Ben: We don’t do this naturally, but people put a product out there or do a launch, and they think that what they see in immediate sales is it. Really, for the people who are really interested in that but can’t purchase it yet, you have the opportunity for future customers. It’s great to invest in people who will buy from you now, but it’s also good to invest in people who will buy from you later. 1:06:07 Sean: That’s the way I think of podcasting. We’re doing everything we can and need to to survive now, and everything else is 100% invested back into the business and the long game. With this podcast, I want to give people so much that they feel indebted to us, that they feel like, “You know what, I will go to seanwes conference. I will sign up for the Community, now that I realize it’s not just designers or developers,” or whatever they thought the Community was. 1:06:44 Or they think, “You know, I will buy a course. I know that Sean had that Learn Lettering thing, but I’m not into lettering, and I’m not sure about the Community. I think I will get Supercharge Your Writing.” Five years from now, the 16 year old is 21, and in ten years the 18 year old is 28, and they buy something from me. I want to give them so much now, uninterrupted, without any friction, that that makes sense in ten years. 1:07:09 Everyone else doesn’t see this. They see now. They don’t even see tomorrow. They see, “I have a podcast now. How can I make money now? I’m going to jam as many sponsors as I can into this thing to where most of my listeners don’t quit listening.” It’s the short game. 1:07:45 Cita said, “For content marketing, which one is better; long post (~10000 words) or shorter ones (2000-3000 words)?” Some people might even do 800. “I’ve heard a couple of times before that people are getting traction to their web site with only several long posts instead of many short ones.” There isn’t a better/worse for long term vs. short term. It’s about making the content as long as it needs to be. I know that’s not a satisfactory answer, but I’ll try to elaborate a little bit. 1:08:22 Don’t make it unnecessarily long because you feel like it needs to be long, elaborating on simple points. That’s one side of the coin. The other side of the coin is, don’t simplify necessarily complex information. The perfect case of that is Value-Based Pricing. The reason Justin and I are writing tens upon tens of thousands of words for our course, the reason we’ve taught so much, and the reason why the last few episodes we did were so long—one had 10,000 words of shownotes—was because this is not simple stuff. It’s complex stuff. Everything is based on something else, predicated on something else, and you have to set the stage. 1:09:25 Ben: Trying to keep in mind trends for how long people will keep their attention on something, the foundation of this answer finds itself in the quality of the content and how well you’re communicating whatever it is. Let’s say that a single topic, because of how complex it is, takes several thousand words. Does it make sense to think about that strategically and ask the question, “Could this be broken up into two or three posts instead of putting it all in one post?” Make a series out of it. 1:10:10 “This is part one of this topic, and next week I’m going to release part two.” Break it up to serve the trend. On the other side of it, if you find that it’s not complex enough to come up with 1,000 words, does it make sense to find other like things to combine with it to make it a little bit more engaging, again, to serve whatever the trend is? 1:10:40 Sean: That’s an interesting angle. This is the front-loading value approach I was talking about earlier in the show. I will need to go more in depth on this, but generally, it’s providing value immediately on the page. It works as a stand alone thing. If they only read that, they take it away and have whatever they need for whatever the topic was. If they want more, it links to another page that’s already there. This approach, as opposed to getting someone’s email immediately and then sending them an email and another email a few days later, allows for binging, which is a popular form of consumption nowadays, especially with Netflix. 1:11:37 Ben: Garrett in the chat said, “Open loop,” which is kind of a vital part of bingeing. 1:11:49 Sean: The thing about bingeing is that you want to have it all available right then, when they can listen to it or read it. If you were going to have a three part series, it’s better to have that available immediately for people to binge. The only way it would work properly as a three part series would be if each of them stood on their own. If you’re talking about one concept and it takes 10,000 words because it’s necessarily complex, you wouldn’t want to arbitrarily break that into three chunks, because that’s disappointing. 1:12:26 It needs to be stand alone content pillars, and if you’re smart, you use open loops and story to tie them together and get people hooked, so they want to hear the second installment. That’s the simplest way. Don’t break up single concepts that need to be conveyed in one place. 1:13:04 Know your goal. Are you educating here? Are you selling? Are you trying to move someone from point A to point B, and what is that? Keep that goal in mind, and don’t get so caught up on whether it needs to be long or short. Focus more on whether it serves the goal and reaches the person you want to reach. 1:13:34 Those of you who are already writing regularly, you have a committed writing schedule that you’re on right now, don’t get stuck in a rut. I got stuck in a rut. That rut is, “I write a blog every Wednesday,” and you end up just filling this blog. “I have to write about something today. I’m not feeling motivated, so I guess I’ll write about motivation.” I’ve done it before. It’s a great trick. You get your blog post out and everyone rejoices, but it’s not very purposeful. 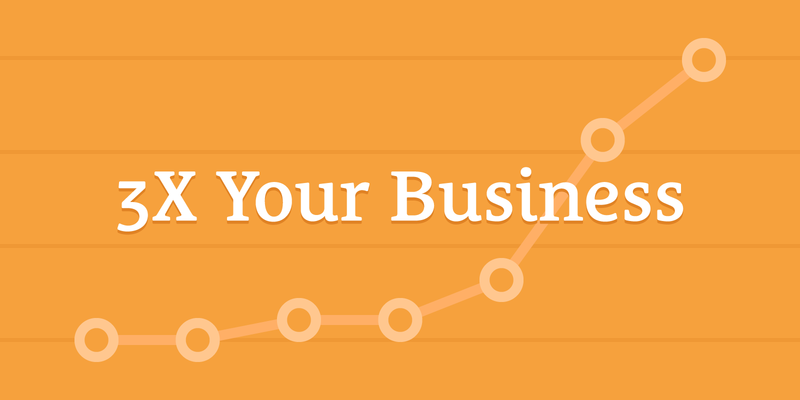 It’s not moving the needle in your business—that’s an expression, like a measuring instrument. 1:14:39 It’s a measurement, a gauge, like for a speedometer or something. Moving the needle is producing tangible results. Don’t get stuck in a rut with writing; do things that move the needle in your business. What moves the needle in your business? Something that increases revenue. How do you increase revenue? You need to sell things, more of what you’re already selling. If you’re not selling something, go back to episode 177. If you are selling something, you need to get purposeful about what you’re writing. 1:15:34 You need to take your next writing day, or the day before that, and think about where you’re going over the next eight posts. What is this doing? Know your goal. That’s my recommendation for people who already have a writing habit developed. 1:15:59 Ben: I really love the idea of the editorial calendar. Let’s say you know when your product is going to launch. If you’re planning your topics ahead and you have a calendar for yourself, you can anticipate when those things are coming out, you can produce content for a certain date. It’s a powerful way to tie the consistency of your content to the launch of a product. If you’re being purposeful about talking about a product you’re launching, it’s a good way to make sure you don’t publish something about a product you’ve already launched as if you haven’t launched it yet. 1:16:56 Can you do that for a product that already exists, that you’ve launched in the past? Can you make it a part of your editorial schedule? You aren’t ramping up to the launch, but you have some story arc in your content that leads to highlighting that product again? 1:17:32 Sean: Launch it again, almost exactly the same way you did before. Why not? Educate, ramp up to it again. Get creative. Add some bonuses, and give your past customers the bonus. Tell the new customers you’re adding it. Make the bonus go away, keep it, use it to make the course more valuable—you can be creative. It doesn’t have to be a course. I’m glad Ben brought up the editorial calendar. Just knowing the concept of an editorial calendar and being purposeful with your writing should be able to give people ideas. 1:18:19 If you want to get two months of your content planned out in a sensible, comprehensible way in ten minutes, that’s what we teach at SuperchargeYourWriting.com. So, go sign up. It seems unreal, but that’s what I show you. 1:18:55 Scotty asks, “What are some hard examples where you’ve combined both content marketing and copywriting?” Hopefully most of the pieces of content I’ve put out, but not all of them. Most of the examples in the past are not good examples. This is a good example. I’m going to be redoing how I do landing pages after that consult that I did—rather than trying to close the deal and get the email, I’m going to turn them into something really educational, something people can read and get value out of immediately. That will increase the likelihood that people will share it. 1:19:40 Because I’m going to be applying this to all of my landing pages, a good example of this will be SuperchargeYourWriting.com. We’re going to be launching a new page, and Kyle has done a bunch of beautiful illustrations for it. I’m excited about it. That will end up being a good example. Previously, I used to try and relate to the person and tell them this is a good thing and that they should sign up. Instead of trying to convince them, I’m going to give it to them right there, to where they can have value and take it away. More than likely, after they’ve appreciated it, they’ll be inclined to sign up to get more. 1:20:40 Ben: I can’t overstate the value of writing for whatever field you’re in. I was meeting with some clients this morning. One of them is a Community member, and they do a comedy thing and a lifestyle blog. Writing is where it has to start. They do a lot of improvised stuff, but for them to sell and build their audience and get a return on the value they’re providing, they have to write. 1:21:19 Sean: Even improv comes from writing. This podcast, a lot of what we talk about and that I touch on, are things I’ve written about before. Sometimes, I go off of my outline, but most of this is off the cuff with a few prompts. Because I’ve written about things before, it comes to my mind, and even if it’s improv it’s still good. Cory, what are you going to change as a result of this episode? 1:22:14 Cory: I want to learn more about the editorial calendar. 1:22:23 Sean: We have a webinar coming up, and we’ll probably teach people some of the editorial calendar stuff, but there isn’t enough time to go in depth on it in the live training, so the rest of it will be in the course. Cory gets the insider scoop, because he’s producing the video for the course. How do you start writing? 1:23:08 Cory: You have to make the commitment to do it and say, “I’m going to do it tomorrow morning.” I am writing, but I want to get better at planning ahead what I’m going to write about and getting in depth. I know the editorial calendar will help with that. 1:23:52 Sean: The simple takeaway would be to dedicate Monday morning, where you would normally wake up and write, to coming up with the next week’s worth of topics—or two weeks, if you can, and assigning them to days.